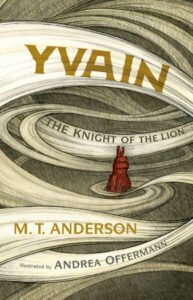 M.T Anderson’s enthralling storytelling and Andrea Offermann’s evocative illustrations transport the reader to the age of the Knights of the Round Table in this rich graphic novel. The narrative follows the formula of an epic tale, following a hero’s journey and his many conquests as he fights to retain his honour and regain his love. The novel’s theme of love and hate existing as one is bittersweet and highlighted by expressive and symbolic artwork. Translated from Chrétien De Troyes’ Yvain, le Chevalier au Lion written eight centuries ago, it is truly a treat to have such a classic and timeless tale printed in the modern format of a graphic novel. Offermann’s illustrations are done primarily in ink and watercolour; this use of traditional materials feels like a nod to the medieval age and keeps a certain integrity that wouldn’t have been present if it had been entirely digital. The artwork makes the story come to life, with thoughtful character designs and colour symbolism. The fight scenes are especially powerful, with every panel dynamic and exciting. Yvain challenges the idea of a hero and what is really means to have honour. The protagonist is not without flaw, and no matter how hard he tries to do the right thing, he sometimes makes the wrong choice, bringing him greater misfortune but never causing him to lose sight of what’s important to him. Yvain is the sort of hero that, while you might not agree with all of his decisions, you can’t help but root for him. Despite having his own motivations, he doesn’t let that get in the way of helping those who need him, leading him into some interesting quests and keeping the reader enthralled. Yvain is an excellent read for all ages; there’s an equal balance of dialogue and action scenes, complete with charming narration, and of course the wonderfully rough and rugged illustrations that create an enchanting fantasy world that’s easy to get lost in. It’s an exciting and accessible way to read a tale from the world of King Arthur and Lady Guinevere. Posted in Book Review and tagged book review, classic, graphic novel.